Jimmie Johnson enters the 'NASCAR After The Lap' at the Pearl Palms Concert Theater inside the Palms Casino Hotel in Las Vegas. 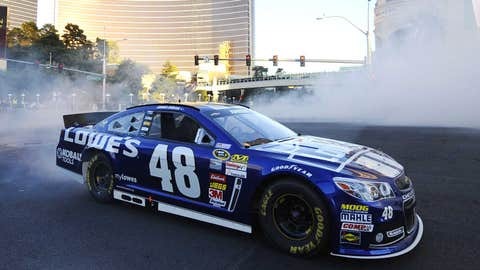 Champion’s Week in Las Vegas officially wraps up tonight with the 2013 NASCAR Sprint Cup Series Awards Banquet at the Wynn Las Vegas at 5 p.m. local time. And what a party it should be, as Jimmie Johnson is formally crowned Sprint Cup champion for the sixth time in the last eight seasons. Fox Sports 2 will televise the banquet starting at 9 p.m. ET, with replays on Fox Sports 1 at 1 a.m. ET Saturday and Sunday at noon. Comedian Jay Mohr will be the host of tonight’s festivities, with a powerhouse musical lineup featuring John Mellencamp, Dierks Bentley and Sara Bareilles. And, as always, there will be plenty of interest on the Red Carpet Walk, as the top 10 NASCAR Sprint Cup drivers and their wives and girlfriends will be dressed to the nines. Of course, the big focus will be on Johnson, who this year joins Richard Petty and the late Dale Earnhardt as the only NASCAR Sprint Cup Series drivers to win six championships. Next year, he’ll try to win a seventh championship, which would tie him with Petty and Earnhardt. Asked if Johnson has any weaknesses, his teammate and four-time Sprint Cup champion Jeff Gordon said there "doesn’t appear to be." Gordon said one secret to Johnson’s success is the 10-race Chase for the Sprint Cup schedule, which has undergone only minor tweaks in the 10-year history of the Chase format. "Those are 10 great tracks for him," Gordon said of Johnson. "Those guys just really know how to get well-prepared. He’s a great driver, they’re a great team." As for tonight’s grand finale, it ought to be an impressive show. Mohr said he’s happy to be back hosting the NASCAR gala. 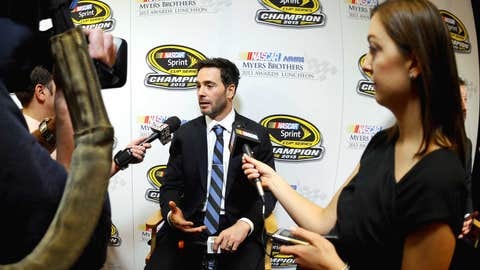 Jimmie Johnson answers questions from the media after the NMPA Myers Brothers Awards Luncheon on Thursday in Las Vegas. "It may be just a coincidence, but I hosted the NASCAR Sprint Cup Series Awards in 2006 when Jimmie Johnson won the first of his five straight titles," said Mohr. "Now, I’m back again to officially crown him champion for a sixth time. I couldn’t be more thrilled to host this show again and help honor some of the best drivers — and athletes — in the world." "The NASCAR Sprint Cup Series Awards are the perfect opportunity to bring together NASCAR’s top drivers and some of the most popular names in Hollywood for a star-powered celebration," said Zane Stoddard, NASCAR vice president of entertainment marketing and business development. "Just like in years past, this is a quality lineup filled with a wide range of personalities and musical genres, so there will be something for everyone."